Fedena 3.5.4 – Ganymede is out and we hope you are as excited as we are. This release brings a fresh, new applicant registration module with a whole bag full of new features and enhancements while removing some not so used features as well (it was a tough decision). Version 3.5.4 also has 2 important features you have asked for: Particulars and discount reporting of fee collected in finance reports and Leave groups for different leave types. Over the past few releases we have been naming our releases after the satellites of different planets and dedicating it to a famous (often forgotten) teacher who made an impact in their field as an educator, researcher, and a leader. 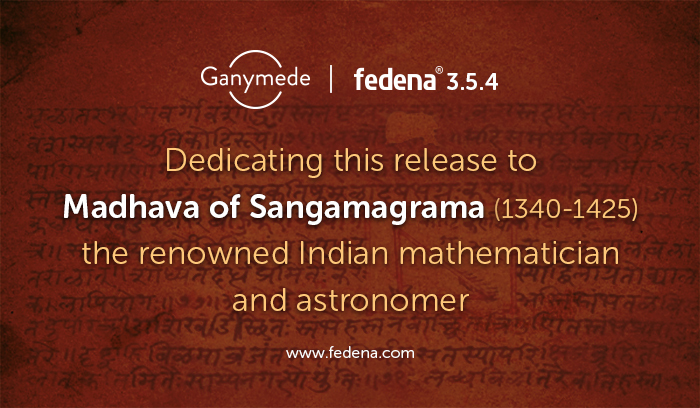 We are excited to dedicate this release to Madhava of Sangamagrama, a mathematician and an astronomer from the state of Kerala, who lived around (c. 1340 – c. 1425) . As with many other Indian mathematicians, he is now increasingly attributed to many theories which made their way to Europe much later. His greatest contribution is towards the formation of the Kerala school of astronomy and mathematics. This school gave many important mathematical concepts particularly in the infinite series and calculus in its quest to solve astronomy problems. Most notable among them are the various Madhava Series (originally attributed to many western researchers and now known together with Madhava) which are a collection of infinite series expressions. You can read more about Madhava and the Kerala School in this 1977 paper by another famous contemporary mathematician from India – C T Rajagopal. The work of these educators and researchers form the foundation of many of the advances we have seen in science and technology and will continue to be for the years to come. There have also been a number of issues fixed in this release, you can find them in the Fedena 3.5.4 Release notes. The new applicant registration comes with many new features like customizable form fields, custom status to handle different stages of the application process and also options like instructions to fill the form, labeled file attachments to help users. We are also deprecating 3 features which were not used as much over these years. All your existing PIN based applications will become normal applications and the amount from the subject based registration will become the registration amount. For the approval process you can now make use of a much better system, the custom status and mark different stages of the application. We hope these changes will increase the functionality and the application of the module. As always we would like your inputs on how we can make it better. For a detailed understanding of the new Applicant Registration Module you can check it out in our previous post or get in touch with us. You can find the release notes here. Our team is already working on a host of new features that will enhance your experience with Fedena. A mobile application for admins, students and parents is getting rigged in our workshop. The features you have requested will soon be live in Fedena, the number one school management system.